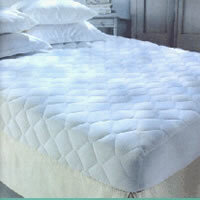 Advanced Sleep Products carries a wide range of mattress pads for all your bedding needs. All pads are made of top quality polyester fiber in different styles including contour fitted, anchor band, and the fitted style. All are graded with varying weights of polyester felt and cotton or poly-cotton cloth.